The fastest growing part of the federal budget is interest on the debt – payments made to service previous borrowing. While interest had already been projected to rise rapidly, the recent tax and budget deals will significantly accelerate that growth. As a result, our latest estimate finds interest costs will almost quadruple between 2017 and 2028 in dollar terms and reach their highest share of Gross Domestic Product (GDP) in history. Last year, the federal government spent $263 billion, or 1.4 percent of GDP, on interest. That is a low level by historical standards due to historically low interest rates; over the past half century, interest has averaged 2 percent of GDP. 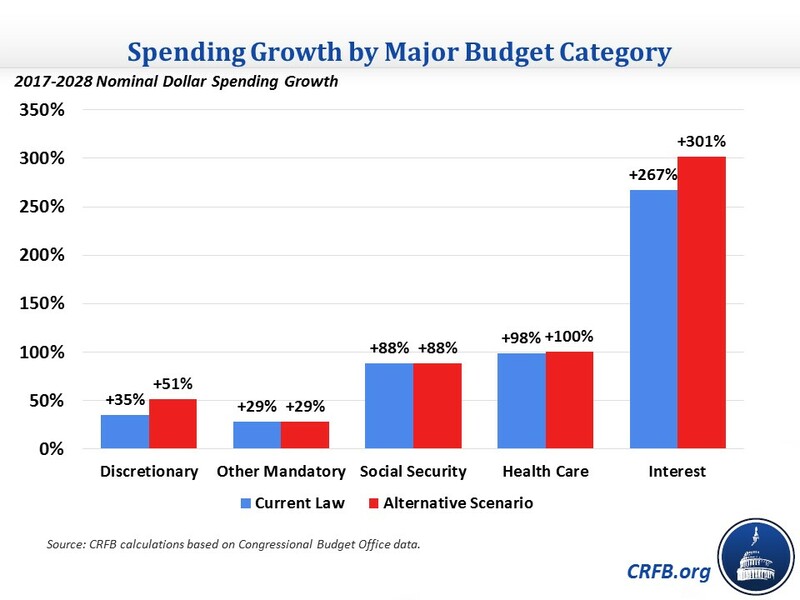 As recently as last June, the Congressional Budget Office (CBO) projected interest spending would grow to above $800 billion and nearly 3 percent of GDP by 2027 as a result of rising interest rates and growing debt levels. Since then, lawmakers have added an additional $2.4 trillion to deficits over the next decade, and it will most certainly result in higher interest payments. By our estimates, annual interest spending will rise from $263 billion (1.4 percent of GDP) in 2017 to $965 billion, or 3.3 percent of GDP, in 2028. The 3.3 percent of GDP total for interest in 2028 would be the highest on record. The previous record was 3.2 percent of GDP in 1991, a time when debt as a percent of GDP was much lower but interest rates were much higher. Importantly, these numbers are in many ways conservative. For one, they may understate the extent to which recent pro-growth but debt-busting legislation will put upward pressure on interest rates and thus interest payments. More significantly, they assume a current law baseline where the budget deal only increases spending for two years and large parts of the tax law expire after eight years or sooner. 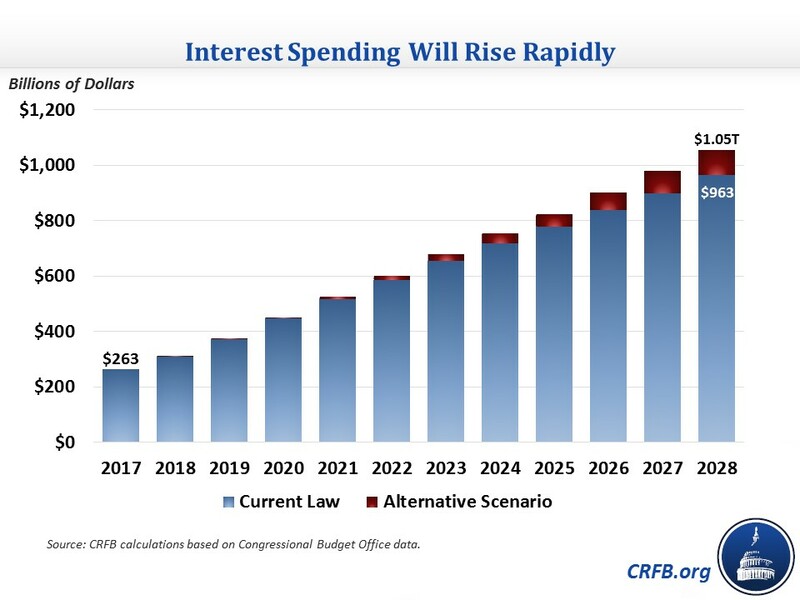 Under our "Alternative Scenario," which assumes policymakers borrow an additional $3.6 trillion through 2028, interest spending will rise to $1.05 trillion, or 3.6 percent of GDP, by 2028. Under either scenario, interest will easily be the fastest growing area of the budget. We estimate that under current law, it will increase by 267 percent in dollars between 2017 and 2028; no other category is over 100 percent. Under our alternative scenario, cumulative growth in interest is even higher at 301 percent; in other words, interest would quadruple between 2017 and 2028. As a result, under current law, the federal government will spend more on interest than it does on Medicaid by 2021 and more than it does on defense by 2024. This rapid growth in interest is due to two factors: increases in debt and interest rates. We project that debt will rise from $14.7 trillion at the end of 2017 to $29.4 trillion in 2028 under current law and $33 trillion under our alternative scenario. With debt increasing 100-125 percent over that time, one would expect a similar increase in interest payments even holding interest rates constant. At the same time, interest rates have been rising; they've increased well over half a percentage point in the last six months alone. Rising debt levels may cause them to rise even more. A one percentage point increase over CBO's interest rate projections each year would cause a nearly $2 trillion increase in debt through 2028. Therefore, the best solution to prevent interest payments from consuming the budget is to enact a comprehensive debt reduction plan. Absent such a plan, an ever-growing share of our budget will be financing past consumption rather than current needs and future investments.